How to melt chocolate for delectable dipping! First, heat water in the bottom of a double boiler until it boils. Remove the bottom of the boiler from the heat. Place the chocolate (wafers or chopped block chocolate) in the top of the double boiler and put it over the bottom of the boiler that contains the water. Stir occasionally. It will take 3-5 minutes until chocolate is melted. 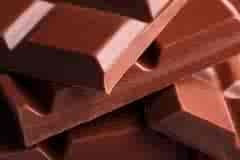 Remove chocolate from over the hot water and allow it to cool. Or, to hasten the process, you can put chocolate over cold water and stir. Either way, chocolate will thicken slightly. By now the hot water in the bottom of the double boiler has become warm. Place the chocolate over the warm water. It is ready to dip! If chocolate is too thick to dip, warm the water a bit. If too thin, cool the water a bit. But never add water to chocolate to thin it--see last point under Microwave Instructions below. Keep stirring chocolate while dipping. It is best to use a glass container that is not too large for the amount of chocolate you are melting. Chop chocolate into small pieces so it will melt quicker. There are several variables when microwaving chocolate: size of the container, the microwave, the size of the pieces of chocolate. But just as a guide, 1 ounce of chocolate will take approx 1 minute to melt. Remember to stir; chocolate may not look melted until it is stirred, and you never want to overcook it. Chocolate will look shiny when it is ready to use. Remove it from the microwave and stir it for at least 30 seconds. Never add water to chocolate to thin it. Water will cause the chocolate to harden and become lumpy. Instead, stir shortening into the chocolate, about 1 to 1-1/2 tablespoons shortening or vegetable oil (not butter or margarine) to a cup of melted chocolate.